Eager to understand what really happened during your last flight? Tacview is a universal flight data analysis tool which enables you to easily record, analyze and understand any flight to improve your skills much faster than with conventional debriefings. Whether you are a private pilot, a virtual squadron leader, or a casual simer, Tacview is an invaluable tool which enables you to understand what really happened and to improve piloting style as well as tactical skills! 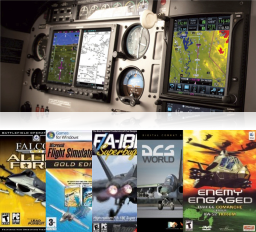 Tacview can read and record flight data from the most popular flight simulators: DCS World, Falcon 4.0, Microsoft Flight Simulator, Lockheed Martin® Prepar3D®, VRS TacPack & Superbug, Enemy Engaged Comanche vs. Hokum, and many more to come (X-Plane is next!). Your favorite flight simulator is not yet supported? Use our comprehensive technical documentation to create your own data exporter. You are a real life pilot? Directly import flight data recorded by your GPS using the GPX and KML file formats or convert any proprietary flight data into the straightforward CSV file format. From your cockpit it is hard to know what happened all around you, especially on the other side of the theater... Use Tacview to take in the whole battlefield with a single glance, while simultanously keeping an eye on the smallest detail. As an instructor, you can now monitor and record trajectories, speed, and positions so you can clearly and easily demonstrate to your cadets how to improve their flight skills. Visualize radar locks and missiles' behavior to efficiently analyze both BVR flights and dogfights. 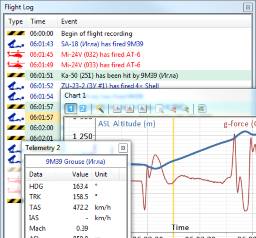 From aspect angle to G forces, display and compare any telemetry number in tables, on aircraft and labels in the 3D view. Analyze the flight envelope and performances like corner speed by drawing detailed charts in just one click! You can even export telemetry data for deeper analysis in your favorite spreadsheet. 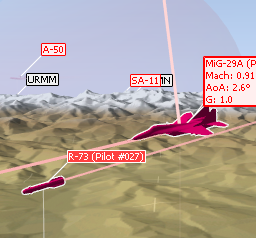 Everything is clear in Tacview: The whole world is synthesized with clean and easy to read colors and shapes. Move freely to look everywhere: Jump into the cockpit of any aircraft or ground unit, center the camera on a dogfight or observe everything at once from a satellite point of view thanks to the powerful strategic view. Detailed event log and statistics summary will help you to quickly understand which tactic has been efficient and where there is room for improvement. Something has failed during your last mission? Now you can easily rewind time to see what happened. Tacview offers you the freedom to track everything instantaneously at any time! And, at the end of the day, don't forget to export flight logs in CSV or XML file formats to keep track of your squadron progress! Whether they are used by flight schools for tactical debriefing or to review real life flight performances, all the tools offered by Tacview will help you to progress and improve your skills faster than ever! Reduce fuel consumption, validate approaches, and optimize aircraft energy like never before. 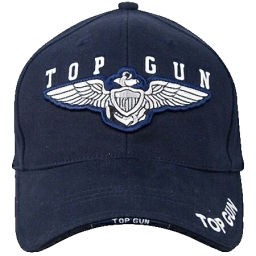 And as a fighter pilot, you can – at last – see and understand who has fired first, why this hidden AAA was able to shoot at you, where the convoy you were looking for was, and how the enemy aircraft evaded two of your missiles the same time! • Enemy Engaged Comanche vs. Hokum. • X-Plane is on its way. And if your favorite flight simulator is not yet supported, it is easy to create your own data exporter based on the comprehensive technical documentation available online! Are you looking for an easy to use and efficient tool to get a quick overview of your flights? Look no further! 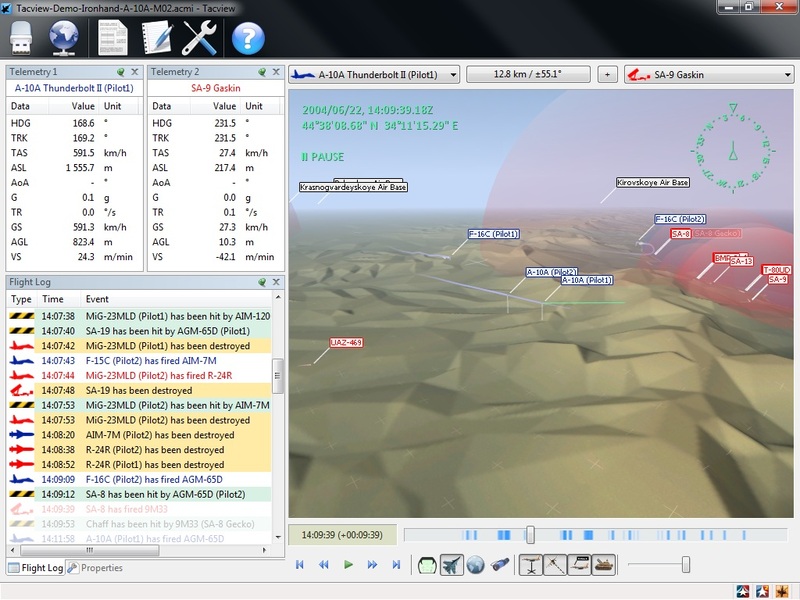 The Free edition of Tacview is for you: You can use it forever without any ad of popup. And if one day you feel the need for more tools, you can upgrade it at any time to the Home or Professional edition.